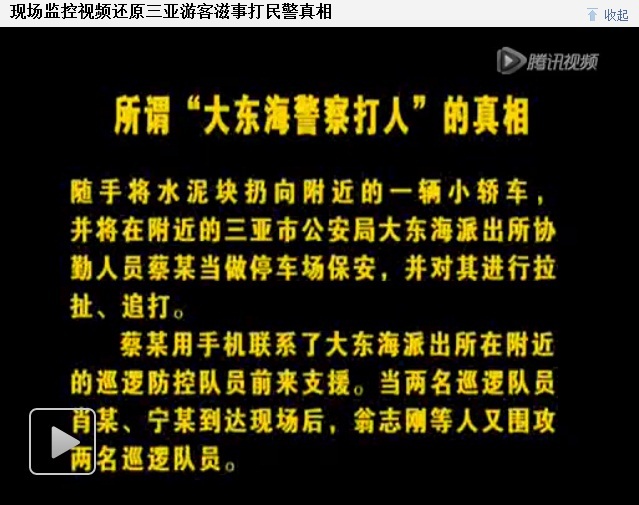 In recent days, a skillfully edited video called “Travel Tragedy by Sanya Police Brutality’ has been circulating on the Internet, and has been viewed and circulated by a large number of concerned netizens. 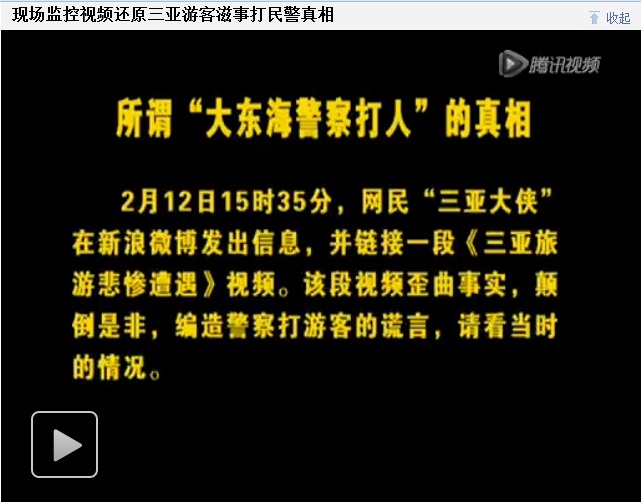 In order to expose the truth of the whole event to the public, the Sanya Municipal Party Committee Promotion Department and Sanya Police Station Bureau have provided parking lot video surveillance footage that captured the incident and released an official report into the incident on February 13. 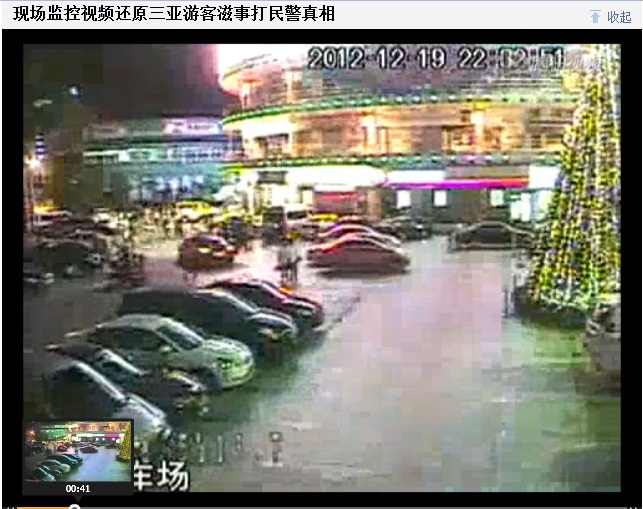 At around 22:30pm on December 19, 2012, an incident involving the assault of police officers occurred in the parking lot in front of Summer Mall in Dadonghai, Sanya. After a meal, four people, Weng Zhigang and his wife Yue Dan, and Li Jianlin and his wife Shan Zhijing (all confirmed as being from Muling City of Heilongjiang Province and currently living in Sanya), discovered that their Porsche had been scratched by a cement stone and suspected the parking lot’s security guard. They got very angry and threw the cement stone away, which smashed a silver car nearby. Because of their anger, they mistook Mr. Cai for a security guard and began to pursue and harass him aggressively, while in fact he is a policeman from the Hedong Police Sub Branch who was on duty nearby. 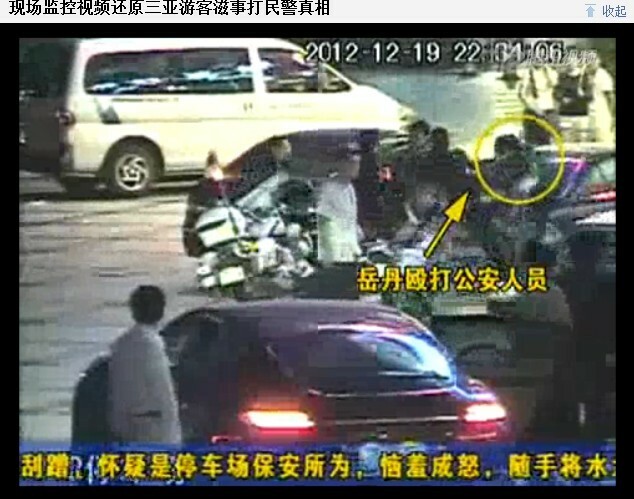 Mr. Cai appealed to policemen nearby to assist him. After two policemen arrived, Weng and the others surrounded them. In the conflict, Weng took off one police officer’s police hat and his wife Yue Dan grabbed a white plastic baton from another police officer’s hands and continued the assault on Mr. Cai, hitting him on his back and right hand. At 22:42pm, more police reinforcements arrived on the scene in order to bring the situation under control. In their handling of the incident, Song Liantao and Zhang Mingzhi, who were both bystanders from Liaoning Province, were found to have interfered with police official duties, especially Song, who was caught trying to grab a police pistol. Several minutes later all 4, including Weng, were brought under control by police and taken to a local police station for further investigations. On December 21, the 4 people including Weng were arrested on suspicion of interfering with public duties and detained by local police at Hedong Poilce Sub Branch. 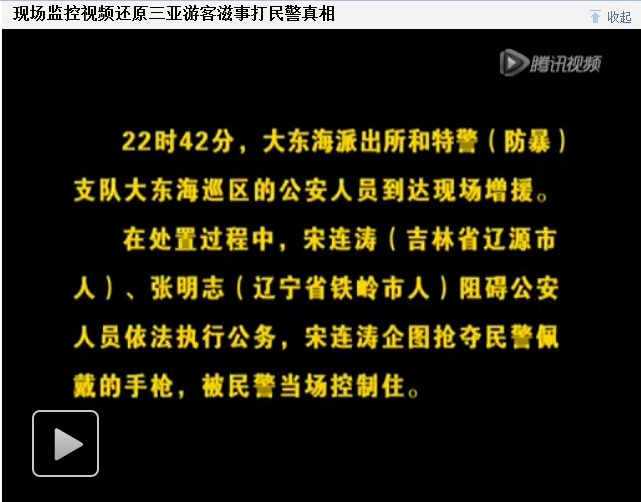 Yue Dan was arrested for intentionally hitting police. Considering she is in her lactation period, she was released on bail pending trial. 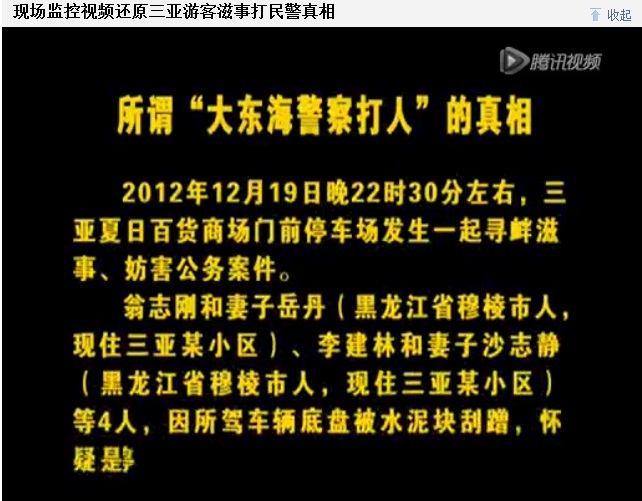 On January 24, 2013, the Sanya Suburbs People’s Procuratorate decided to arrest Weng Zhigang, Li Jianlin, Song Liantao and Zhang Mingzhi, all of them are currently being charged and detained at Sanya Detention Center pending prosecution in Sanya court. 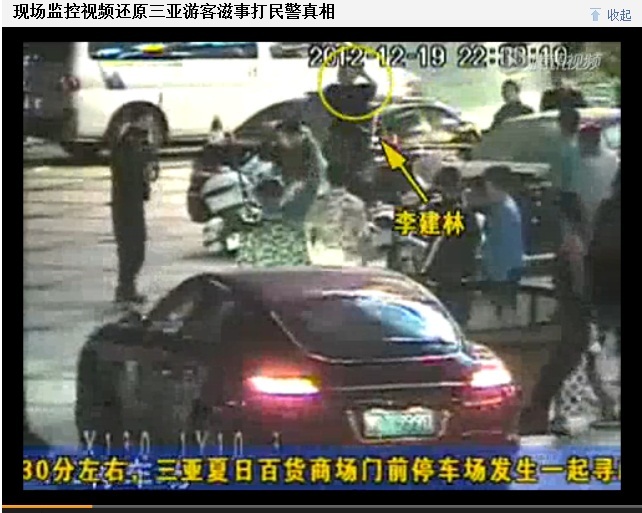 The Sanya Municipal Party Committee Promotion Department and Sanya Police Station Bureau have provided parking lot video surveillance footage that captured the incident and released an official report into the incident on February 13. They mistook Mr. Cai for a security guard and began to pursue and harass him aggressively, while in fact he is a policeman from the Hedong Police Sub Branch who was on duty nearby. 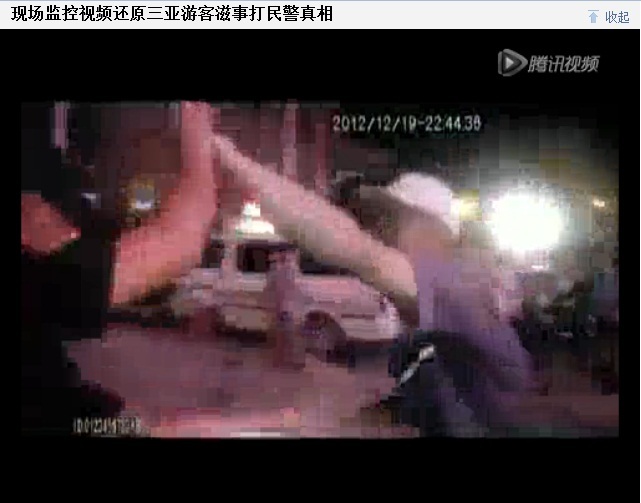 Mr. Cai appealed to policemen nearby to assist him. After two policemen arrived, Weng and the others surrounded them. 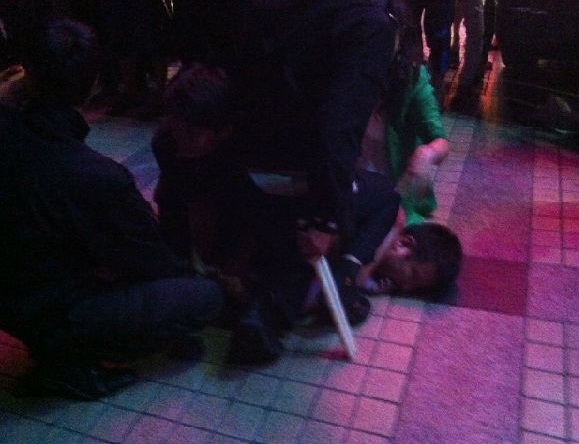 The incident occurred in the parking lot in front of Summer Mall in Dadonghai, Sanya. The four people mistook Mr. Cai for a security guard and began to pursue and harass him aggressively, while in fact he is a policeman from the Hedong Police Sub Branch who was on duty nearby. 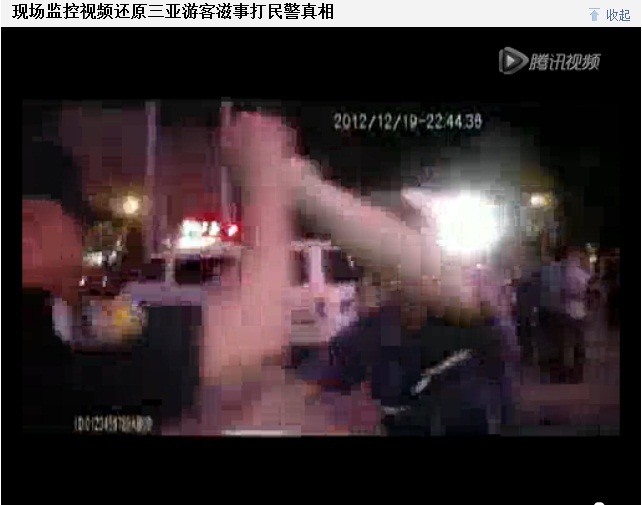 Mr. Cai appealed to policemen nearby to assist him. After two policemen arrived, Weng and the others surrounded them. 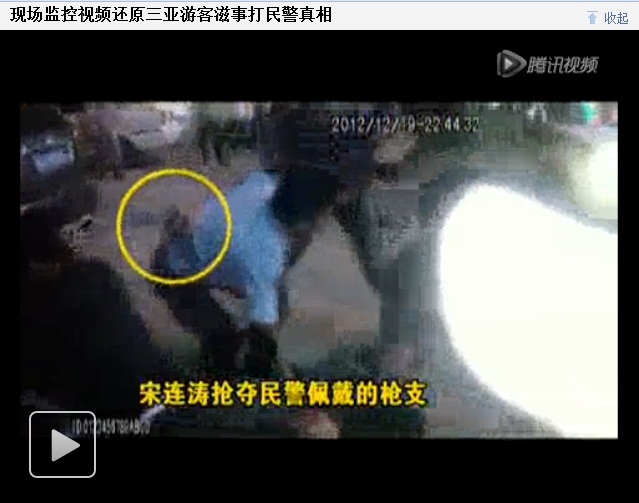 In the conflict, Weng Zhigang (the man in yellow circle) took off one police officer’s police hat. 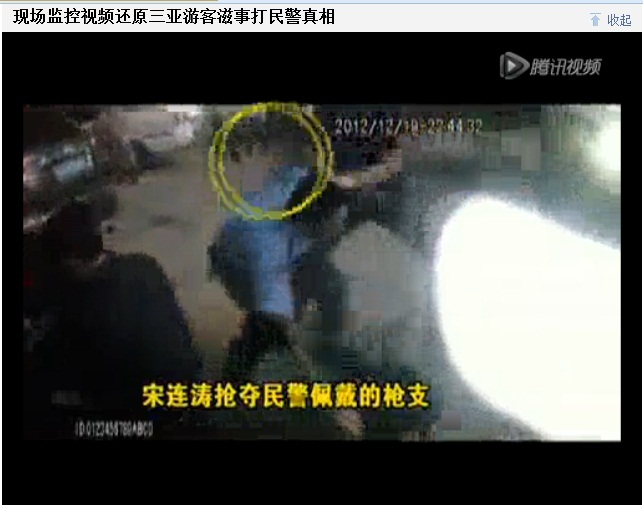 Weng’s wife Yue Dan (the woman in yellow circle) grabbed a white plastic baton from another police officer’s hands and continued the assault on Mr. Cai, hitting him on his back and right hand. 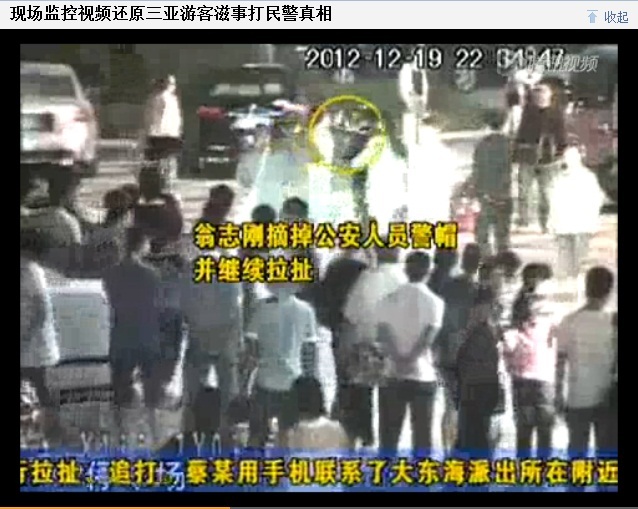 Song Liantao and Zhang Mingzhi, who were both bystanders from Liaoning Province, were found to have interfered with police official duties, especially Song, who was caught trying to grab a police pistol (in yellow circle). Song Liantao and Zhang Mingzhi, who were both bystanders from Liaoning Province, were found to have interfered with police official duties, especially Song, who was caught trying to grab a police pistol. 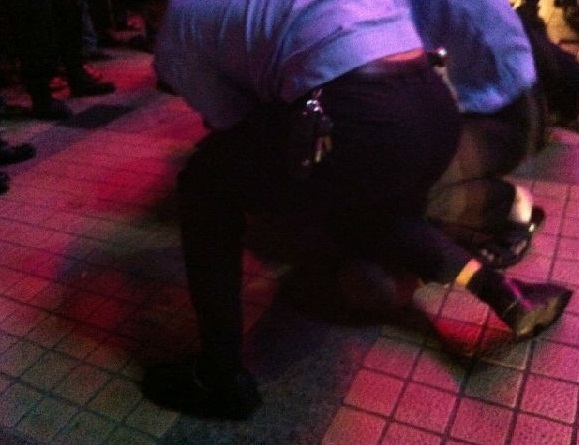 Song is seen grabling with another police officer after failing to grab the pistol.